As visitor numbers increase at National Parks across the country, venturing deeper into the parks for solitude is more and more appealing to NPS visitors. 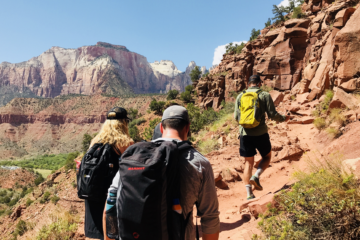 If you’re thinking about planning a backpacking trip into Canyonlands backcountry, there a few things to consider to make sure your trip goes off without a hitch. 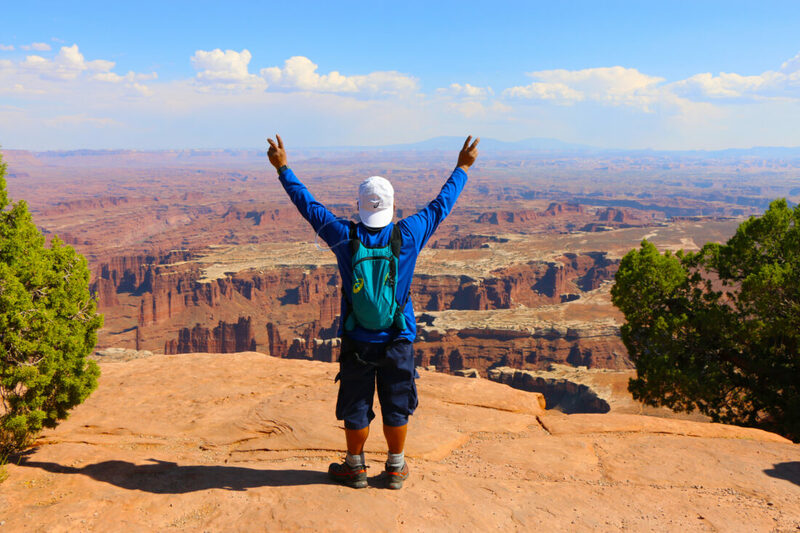 The first thing to consider when planning a backpacking trip into Canyonlands National Park is what permits are required. An important thing to note: a digital version of your permit won’t fly. Park Rangers want to see a printed and signed version of your backcountry permit. The permit process is highly competitive and reservations can fill up within days or hours of their open window. To ensure you obtain a permit, get online 4 months to the day you want to begin your trip at midnight. Permits for The Needles are competitive in Spring, while permits for the White Rim are more popular in spring and fall. Permits are $30 for groups of seven in The Needles and Island in the Sky, and groups of five at The Maze. Hiking through the desert requires map-reading skills, plenty of water, and layers of sunscreen. 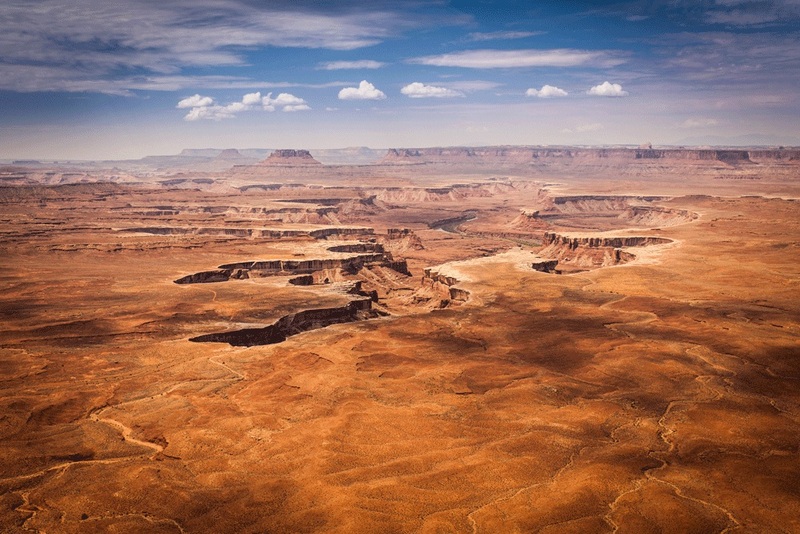 Lack of water is the biggest concern for backpackers in Canyonlands National Park. Unless your trip includes a detour to the Colorado River (which due to its silty nature is hard to filter), you’ll have to rely on the various springs throughout the park, or pack in enough to sustain yourself. Also know that some springs marked on topographic maps may have dried up, so don’t fully rely on finding water in the desert. We compiled a list of our desert hiking essentials to get you started on the right foot. There are over 60 miles of hiking trails in The Needles district. Most are doable in a day by strong hikers. Follow UT 211 which terminates at The Needles trailhead and is the only road to and from the area. A high clearance vehicle is recommended to reach the trailhead. Out of the three main backpacking areas, The Needles is the only one with designated campsites. There are 27 established campsites and three established group sites. Individual campsites are $20/night and reservable online. Most trails to The Needles are marked by cairns (rock piles), and are relatively trafficked. One of the most photographed areas in Canyonlands National Park, Island in the Sky is a giant mesa cut by the Colorado River. When the clouds roll through the canyon, you can see how Island in the Sky received its name. Island in the Sky is accessible via UT 313, and is a 40 minute drive from the Moab visitor center. Backpacking at Island in the Sky requires a 1,000ft descent down rocky talus slopes to the land along the river. One overnight route, Murphy Point, sits along the canyon rim and can be reached without traversing technical terrain. All overnight backpacking at Island in the Sky is in at-large zones. There are no established campsites at Island in the Sky. Campers are required to pitch their tents 1 mile from roads, and 300ft from water sources, archeological sites, and historic sites. The Maze is easily the most remote portion of Canyonlands. Trekkers should portion out at least three days to fully experience the area. Just getting to the trailhead is a full-day excursion, requiring 6-9 hours from Green River, UT. 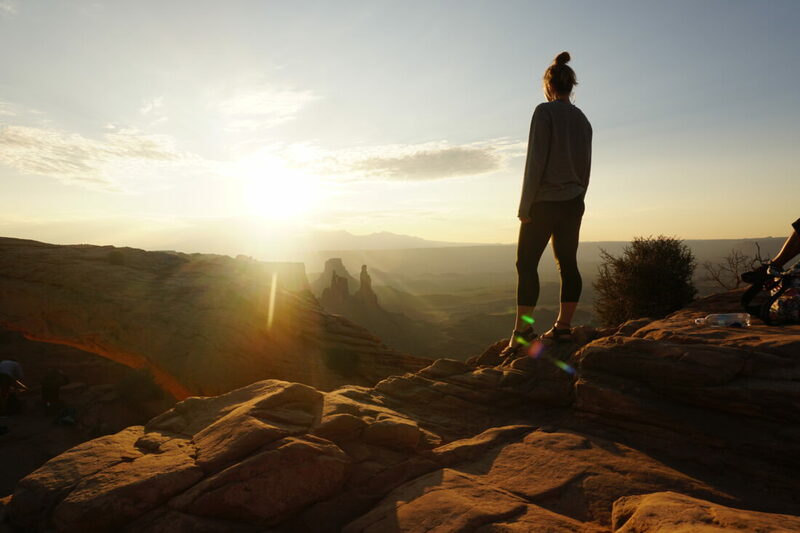 A full week is often necessary to experience this remote and geologically stunning portion of Canyonlands. Only the experienced driver should travel to The Maze in a four-wheel-drive vehicle. The drive requires extra water, gas, a shovel, and a high-lift jack. 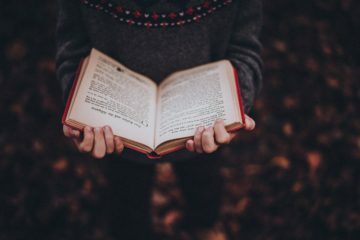 Wherever you decide to go, and whatever hike you decide to do, make sure you’ve done your research and are prepared for the arid desert climate. Always tell someone where you’re going and when you plan to be back. And always enjoy the area that you’re in.